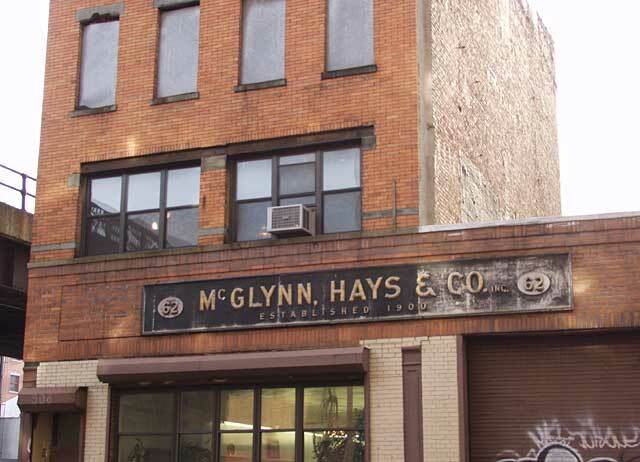 The "62" on this sign refers to McGlynn, Hays's prior location: 62 Grand St. When the company moved, they took their sign with them! Earlier, McGlynn, Hays had been located downtown at 10 Reade St. (1905-24), then 228 West Broadway (1924-29). Founded in 1900 by Thomas P. McGlynn (1873-192?) and Henderson B. Hays (1873-1939), with a specialty in the repair of hydraulic elevators, McGlynn, Hays & Co. recently celebrated its 103rd year in the elevator business. They maintain and repair all types of elevators and escalators, and have a machine shop on the premises for manufacturing elevator parts. They moved to their West 20th St. location in 1997. The sign, however, dates from their Grand St. days: 1929-1997 - i.e., probably around 1930. Latest bulletin! As of 2004, McGlynn, Hays have moved again. They are now located at 605 W. 47th St. Thanks to Christine and Gerard Carlucci (present owners) for letting me know. Gerard's father, Anthony Carlucci, started working for McGlynn, Hays in 1926 when he was 16, was appointed vice-president in 1946, became a part owner in 1966, then with his son, Gerard, bought out the remaining partners in 1997. And the sign once again has moved with the company! (Click for July 2005 photo.) Congratulations to McGlynn, Hays for their loving care of this beautiful and unique sign!